Diva Challenge #233: "New Official Tangle - Zenith"
Guess I was a week ahead. I used Zenith in last week's challenge. May include that one in this post also. Do not like to use things that I have posted before. I wanted to do something different with it also. I was lazy and used what I had available so this is on a Renaissance tile. I wanted to try something different. It did not go as well as I planned. I got a little ambitious when I wanted to do two rows of circles instead of leaving it with one. That is where the problem occurred. In keeping with "no mistakes" and my practice of posting the first tile that I do, I pushed ahead. I really could not think of a way to incorporate what was there so I did the next best thing, Bronx Cheer. Even with that, it did not turn out too poorly. Here is what I came up with. I hope you enjoy it. Tangles used: Hollibaugh, Zenith, Shattuck, Mooka, & Bronx Cheer. Shading and highlighting done by layering colored pencils and white Prismacolor pencil. Have only briefly looked at what others have done. Do not usually get mine done this early in the week so will probably check back through out the week to see what others have posted. Would encourage you to check out the posts at I am the Diva. Try it your self, even if you do not post it. I can tell you that part of the fun of participating is reading the comments that others make on your post. Not everyone comments, but there are a number of people who do. I mentioned earlier that I might post last week's tile also. Here it is. Saves you the time to go back to an earlier post. I started exploring different things that could do starting with a basic shape. I started this over a year ago when I posted a page from my journal and called it "S-Ploration". I did not name any of the patterns and I did not do step outs on most of these. One that I did do, and that developed out of this exploration is Opsess. 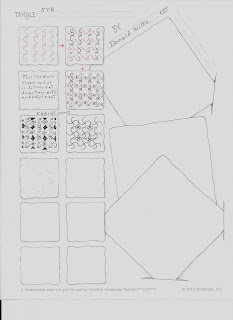 The easiest way to view the journal page is to go to My Tangles page on my blog. You will have to scroll down to S-Ploration. I decided that it was time for me to finally get this done. I started with the one that is probably the most involved but it is still simple. It uses intersecting S's. You can add what ever embellishments you can to finish it off. There is one on the journal page that I would consider a variation that I did not include in the step out. I call this SYR. To pronounce it just say the letters (ess-why-er). I chose this because it reminds me of iron or wire work. Here is the step out. Here is a time that I used it when I was doing a demonstration at an event to generate interest in classes. I am not sure that I have used it in a tile or ZIA. Here is a section of that newsprint, showing this tangle. I will be posting the other step outs that I have created for a few of the other tangles on this page. I hope you have fun with this and would be interested in seeing anything that you might do using this tangle. Did not realize how out of practice I was in doing Zendalas. I have used the round Zendala tiles before but more recently it has not been with a template. It is taking me a little bit of adjustment having a template and deciding how I want to use it or even what tangles come to mind when I look at it. I have to admit that the recent templates have been an additional challenge for me. The template is similar to a string and it is a guide that you can decide how you want to follow. I have tended to not modify the templates in the past. May have to revisit that. Here is what I ended up with. I hope you enjoy it. I was hoping to participate in the Zendala Dare a little more regularly. Have not been able to do so. Will have to examine that as I continue to have a number of other things that are occupying my time. Not sure if some of the challenges lately have been the style of the templates or just my lack of doing them. Am looking forward to looking at what others have done. If you have not done so would encourage you to go to The Bright Owl and look at what others have done. Give it a try yourself. You do not have to use a circle tile to do it. This will be my final post on this week's Diva Challenge. I like the tangle Betweed. I have seen some really great ways that it has been used. I have to admit that I am not always as pleased with the way that mine have turned out. My original intent was to do a white on black tile. That changed when I went to start and I found out I did not have the container with my white gel pens. So I began looking at what I had with me. I had some regular gel pens as well as Glaze and Moonlight gel pens. Decided to go with the latter. These are both Sakura products. Here is what I ended up with. I hope you enjoy it. I chose not to do any shading on this. I may decide to try somethings with either some water color pencils or Prismacolor pencils but I kind of like it the way it is. That is unusual for me as I usually like the impact shading has on a tile. As I mentioned earlier, this was done with Sakura Moonlight Gel pens. They do tend to be rather bright and some of them are fluorescent. They do tend to look a little different after they dry. Actually the color came out more after they dried. If you have not all ready visited I am the Diva, would encourage you to do so. This is one that is really a good one for people to participate in if they have not done so before. I encourage it , even if you do not post it. I mentioned in the beginning that this would be my last post on this week's challenge. I did not really explain why. It really has to do with time. It has been a while since I have participated in the Zendala Dare and I am hoping to tackle that template this week. There are only so many hours in a day and have to choose how I am going to use them. Here is the second tile I did for this week's Diva Challenge. It is the Audio 2 Meditation. I decided to go out of the box a little and used a Renaissance tile and a brown micron on this instead of a Bijou or original tile. This presented a little more of a challenge. There was a section where she was talking about he shading or highlighting that I did not understand what she was saying to do. I think this is a difficulty with the spoken, and written language, that many times things seem really clear to us because of our frame of reference. Others who do not have this hear it differently. Remember an old communication exercise that use to do where a person had a figure on a piece of paper and what they had to do is give verbal directions to the group to draw the figure on the paper. The person could not use there hands to illustrate and the people could not ask questions. Was always interesting to see the variations that would occur. The idea of there being a "right way" was not relevant in this exercise but it is hard for it not to creep in. Did have to remind myself of that when I was unsure. Made it a little easier to proceed. I have to admit that as I have looked at others that have done this same audio prompt, I am looking to see how they addressed it. Here is what I came up with. I hope you enjoy it. Tangles used: Nipa. Shading done with HB pencil. I added a little extra shading to accent the movement on this one. I was aware of the tangle that was being used fairly into the directions. Tried to not let this influence me. This is one that I would encourage you to participate in as if you just look at the posts of the audio challenges, not sure that it will mean as much to you. This week's Diva Challenge is definitely a different one. Will do a couple of posts because of the way it is structured. Basically, it starts out like the old Mission Impossible , "....Your mission, should you choose to accept it is ..." Not really quite like that but can chose to do all or just some of them. I have completed a couple of the audio challenges and hopefully can get to Betweed sometime this week. This first one is the Audio 1 challenge and I did it on a Bijou tile. Here is what I came up with. This was interesting as I had an idea with the first instruction what tangle was going to be used. I tried to pay attention to just he instructions rather than thinking ahead. I added a little more shading to this to highlight the whole tangle. Will check out what others have done at least for this part of the challenge. Will have to visit a lot for this. Two class lessons accomplished with one project: "Tangle play and There are no mistakes"
Really did not plan on posting this but things have a way of just happening sometimes. I have been busy getting things ready for a class on Saturday August 22. We are doing the 3D ZIA balls. Figured it would be a good project this early in case people wanted to use it for Christmas. Well in the process of making an example for them to look at, I ended up addressing two Zentangle® principles. They both occurred because of the same thing. I will show you the picture of what I was doing so I can refer to it. I was working on the middle stripe and decided to use Sandra Strait's tangle Fohbraid. I checked her blog for the step out. I knew I was going to have to do some playing with it because of the shape of the tangle and the space that I was putting it in. Kind of putting a round peg in a square hole. Felt that for this, I needed to have minimal negative space. Well before I could really decide what to do after I had the main part of the tangle done, I changed one of the lines. The arc coming from the corner of the triangle is suppose to come down to the arc underneath it. OOPS!! Now what to do. I really did not want to start over. I was not doing any of the embellishment inside the sections so I just continued what I started, not really being sure what I was going to do. I am not sure when I I decided what I was going to do. I looked at the spaces and just let it happen. I was pleased with the way that it turned out. I made a copy of this so I can use it in some upcoming classes, as well as the one tomorrow. Figured one of the best ways to illustrate those two principles was my own examples. In case you are interested, here is what the finished project looks like. Think it turned out well. Looking forward to class tomorrow. Tangles used , from the top down: Flora, by Sandy Steen Bartholomew, sorry but I do not remember the name of the leaf-like tangle down the middle. Next is Tierso with the Fohbraid variation. Last is Japonica, also by Sandra Strait, with Shattuck (with highlights). Diva Challenge #231: Guest Blogger - Sharla Hicks, CZT - " The Undulating Tangles in C and S minor"
This week's guest blogger has an interesting challenge. It is to take a couple of the basic strokes and play with them. There are a few more suggestions. One is to take familiar tangles and work in a series. The other is to take a new one and begin a new series. This makes a little more sense if you look at her entire post here. She developed her style by redoing the same tangle and changing or pushing each attempt. I think this is what she means by a series. When I hear undulating, the first person that I think of is Helen Williams. She has a way of weaving her tangles and lines across the page that is unique to her. So I chose to use one of her patterns, Tumbleweed. Cannot say that it is undulating as what hers would be, but it was interesting doing it. At some time I would like to try to do a little more with it. Here is what I came up with. I hope you enjoy it. Shading done with 4B, 6B, and HB pencils. I think I may have gotten a little carried away with the shading. I thought of using gray Prismacolor pencils to do the shading but I only have 2 gradients, 30% and a 50%. Did not think this provided enough variance. For some reason when I try to do Tumbleweed, I do not get that nice broad flow that I would like. Need to keep working with it. I have not had a chance to look at many of the things that others have posted. A few have shown up in my blog reader. Hope can look at them during the rest of the week. If you have not all ready looked at the other post at I am the Diva, would encourage you to do so. Give it a try yourself, even if you do not post it. This week I did not have to make a choice between doing the Diva Challenge or the Zendala Dare as the guest Blogger is Erin Olson, the CZT that does the Zendala Dare. Since she has returned she has definitely come up with some unique templates. This week is no exception. I am not sure about this one. I usually use tangles to complete the different sections. While I used some, or variations of some it is mostly line work. That is different for me. I have seen some people that can do this with really stellar results. Mine are not in that category but it is okay. Here is what I came up with. I hope you enjoy it. Shading done with 2B pencil. Lately have been spending more time trying to get my inventory back up. That is one reason that I have not had as much time to participate, or even respond to recent challenges. It also a reason why my blogs have been pretty simple and maybe a little terse. Hopefully things will slow down a little soon. I have not looked at what others have posted. I am sure that there are a lot of interesting creations. If you have not checked them out all ready would encourage you to go to I am the Diva to do so. These week's Guest Blogger is Sandy Hunter. She may be best known for some of her tangles and her tangle remix. They are fun to do . Her challenge is not just to have some negative space, but to make it the focus of the tile. This was harder than I thought. I have not used strings for a while. I usually just pick a tangle and start. I though about doing this and seeing what negative space was left. I decided to not do this and settled for a string with a basic star/flower shape. I had some ideas of what I wanted to do but I am not sure that it ended up leaving the white space as the star of the tile. I decided to use the black/brown color combo and this may have taken away from having the negative space be the focus. The tile itself, I like but not sure that it was successful in addressing the challenge. Here is what I came up with. I hope you enjoy it. Shading done with HB, 4B graphite pencils. Color highlighting done with Prismacolor Pencils (Golden rod, Burnt Ochre, and White. When I decided to use Merryweather, did not realize that it was a tangle developed by the Sandy Hunter. Went to check the step-out and then saw it. Decided to keep it as it seemed to fit. If you have not all ready done so, would encourage you to go to I am the Diva to look at the pieces of art that have been posted. Have another newer CZT being the guest blogger for the Diva Challenge. Cari Sultanik is also the lady who started the FB Zentangle Prayers for Hayden. This was to support a little girl, and her family, that is struggling with cancer. People she asked that people do a tile and post it to the page but a number of people also sent the tiles as well. But that is not what this challenge is about. This is about celebrating things organic and natural. She stated that she has always liked the tangles that imitate nature. I have been busy the last couple of weeks getting ready for classes, an event, deciding to put items in a local consignment/reuse store, and my job has kept me busy. I did not even do a tile for last week's challenge. I was not sure that I would do anything this week either. After I started it, I was glad that I did. It was nice to do something just to tangle and not preparing things. Was definitely ikn production mode before. This was just relaxing. I enjoy doing the organic tangles also but there are times when I can be frustrated by them. I chose to use some old faithful tangles for this one. This is what I came up with. I hope you enjoy it. Tangles used: Featherfall, Phicops, Abundies, & Tipple. I am not sure about the pod tangle. It is kind a cross between In-a-pod and Sandy Steen Bartholomew's Awdry. It may also be one that someone else has done and I just do not know the name of it. Shading is done with HB, 2B, and 4B pencils. Carol Ohl's Featherfall is one of my favorite oranic patterns. I like the way that you can have them close together and it still looks nice. Did not really intend it, but after I was doing this had an aquatic character to it. I am pleased with the way this turned out as well as enjoyed doing it. I have not looked at many of the pieces of work that others posted. I saw a few that were in my blog reader. Probably will not have time to look at a lot of them, but hope to get to as many as I can. Will have to see how many I can comment on. I know I like it when people take the time to comment on my work. By this time, as this is really a late post, I am sure that most people have all ready looked at the posts but if not go to I am the Diva and check things out.